← Ketubah Couple: Casey & Mark’s Romantic Silhouette Ketubah! 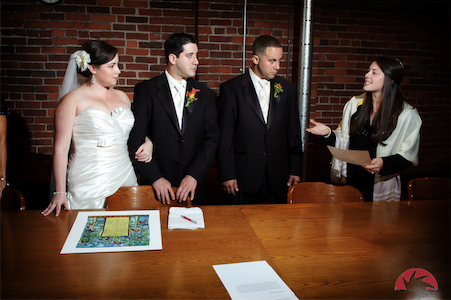 Our vision is to help every couple who is getting married to get a Ketubah. A Ketubah — honoring your marriage vows by memorializing them in a just awesome way — is too important to come up with an excuse not to get a great one. You never found a Ketubah you loved? We’ll solve that: not only are our Ketubot unique and great art to hang on your wall, but we can create a custom Ketubah based on your tastes and desires. So not having found an awesome Ketubah is not an excuse. A Ketubah is too expensive? Don’t worry, we offer various price levels, including our recently-launched “contract with blanks” versions where you write in your names yourself. This saves us a lot of work so we can offer a very affordable Ketubah. No text you’ve found captures your relationship? Don’t worry — we’ll work with you to find the write text, or help you write your own vows to best capture your own relationship. Too much work to make it happen? Don’t worry, we make the process simple and fun. We’ll even organize everything with your Rabbi – so you don’t need to think or worry about it! Signing a symbolic contract to sanctify your commitment isn’t meaningful to you? In that case, a Ketubah isn’t for you and we can’t help you — and we will with you the best of luck and Mazel Tov anyway!